A few years ago, I went to a party held in the home of a former Minneapolis Institute of Arts dean. We guests gathered in his studio for the night's merriment. I'm always thrilled when entering such spaces as they invariably provide a creative jolt. In this instance, however, I wasn't only inspired by the art displayed throughout the space but also the flooring of the dean's studio. It was raw plywood with only smatterings of paint from his work finishing it here and there. "Plywood," I whispered to my boo. "We should do that someday." He nodded in return. To foster my dream, I gathered some images of DIY plywood flooring from across the interweb. Not only are they gorgeous, they'd be a very cost effective alternative to traditional wood flooring. 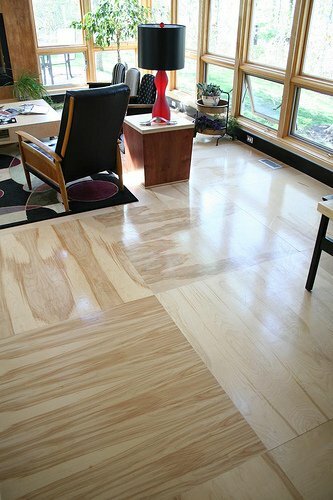 Like your plywood floors a little less woody? Check out this painted plywood floor compliments of Nate Berkus. Finally, in this bedroom, the plywood was cut into 12" wide strips. The project cost just $200 bucks, including the headboard and nightstand. Like the look? Here's a tutorial.